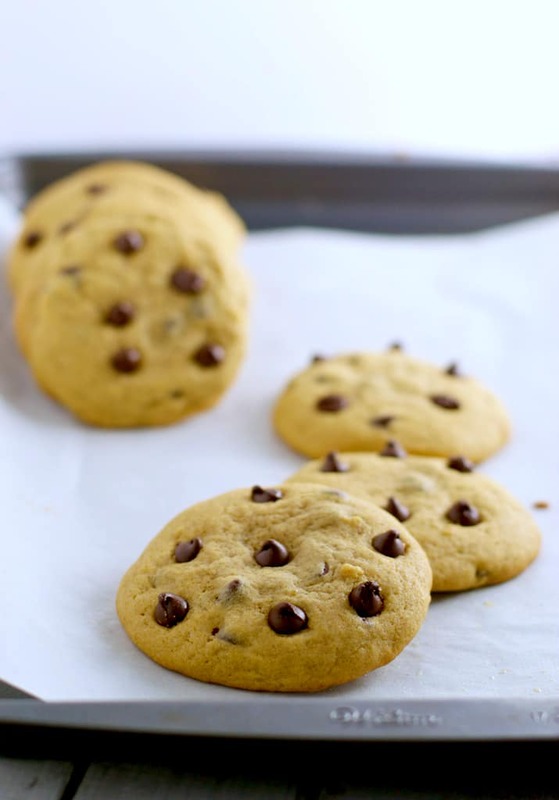 Here’s a recipe for soft and chewy Chocolate Chip cookies that you will feel less guilty chomping down because it contains whole wheat flour too! Who does not like Chocolate chip cookies, right? Since Christmas is a few days away, I thought it would be a good idea to go over the recipe I have for Chocolate chip cookies and decided to experiment by replacing part of the all purpose flour that with whole wheat flour and the results were AMAZING. While adding whole wheat flour makes the recipe a lot more healthier, make sure you don’t overeat these yummy goodies. A piece of advice – share it with your neighbors and they will love you for it. Check out the recipe and please let me know how you liked replacing the all purpose flour partly with whole wheat flour. 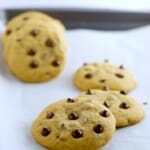 Baking soda is a key element that helps the cookies spread. If your baking soda is more than 6 months old, do not use it. The mixture should not be very sticky, you should be able to pull the dough into balls. Add flour as needed to get the consistency right. I added 2 spoons of cornstarch to make it extra chewy. It is an optional ingredient. Feel free to skip it, if you don’t have it. Mix the dry ingredients: In a bowl, whisk together both flours, salt, cornstarch and baking soda. Mix the wet and dry ingredients:Add the flour mixture and mix until they are combined (don't overdo it - maybe for a minute. The mixture should not be extremely sticky, should be almost dough like but slightly sticky. Add flour as needed to get the consistency right).Add the chocolate chips and mix them for 15 seconds. You are ready to bake.